Most of India’s memes come from politicians. The biggest propagator of them are obviously Rahul Gandhi who does it with just a hug and a wink. Narendra Modi has given us some quality ones by simply doing Yoga. And while many more are in the race to rule the internet as a meme, the latest one to join them is Yogi Adityanath. According to DNA, torrential rains have heavily affected parts of Uttar Pradesh. 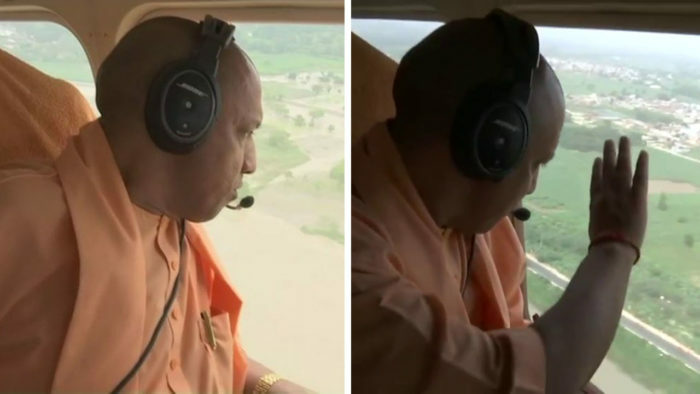 So, Yogi Adityanath decided to do an aerial survey of the flooded areas. All was fine until he waved. As the CM of UP, it’s understandable that he had to make a customary visit of the areas that were most affected by natural disasters. There were no problems in the plane, which means his journey was fine. Those headphones look great as well. But then he began waving down from the plane not once, but twice. Now mere mortals like us understand visibility and distance. But it seems those concepts are lost on the Yogi. That’s why the obvious question that popped up was.. Exactly. What the hell was he waving at? Was it a bird? Was it a plane? Was it Superman? The internet was helpful and gave some thoroughly researched answers to the question that who was Yogi Adityanath waving at? 1. Stop waving and drive the plane! 2. Ah! That makes more sense. 3. Didn’t know that Yogi’s a fan of ‘Border’. 4. Don’t get your hopes up. 6. Huh! He should’ve used both his hands then. Good bye to secular democracy. 8. Give that Photoshop artist an award then. 10. That’s some advance stuff right there. I do understand Yogi Adityanath’s bhavna but that won’t be enough to alter the simple laws of physics and biology. So, maybe next time he can put on a huge display atop his plane to show a magnified version of him waving at them.